The second edition of What to Eat During Cancer Treatment contains more than 130 recipes—including 102 new dishes. The book provides practical tips and suggestions to help patients and their caregivers anticipate—and overcome—the major challenges of eating well during treatment. The book encompasses many years of clinical experience in working with cancer patients, knowing their nutritional needs, and finding ways to help them eat well when they don't feel well. 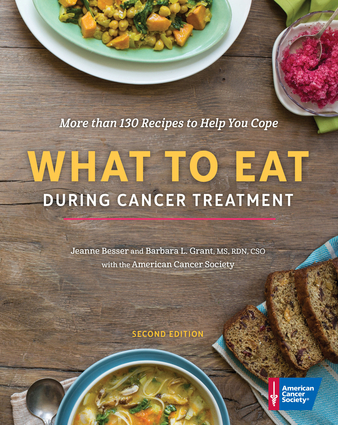 Written by Jeanne Besser, an award-winning cookbook author; Barbara Grant, a board-certified specialist in oncology nutrition; and experts in nutrition and cancer care from the American Cancer Society, the book contains a wealth of information for both patients and their families. The book's primary focus is on the seven most common eating-related side effects of cancer treatment—nausea, diarrhea, constipation, trouble swallowing, sore mouth, unintentional weight loss, and taste alterations—and the foods that will be acceptable when these side effects occur. Chapters are organized by these side effects, and introductory information for each section is based on evidence-based research and sound clinical experience. Symbols are used throughout to flag recipes that apply to more than one side effect, making the book a versatile resource for different phases and types of cancer treatment. The book will appeal both to people undergoing treatment and the caregivers, family, and friends who are providing support. Throughout the book are beautiful, full-color photographs, along with features such as advice for the caregiver, food safety basics, answers to frequently asked questions about nutrition and treatment, how to avoid excess weight gain during treatment, and tips for easy snacks, staying hydrated, and dealing with vitamin and mineral deficiencies. The American Cancer Society is the nationwide community-based voluntary health organization dedicated to eliminating cancer as a major health problem by preventing cancer, saving lives, and diminishing suffering from cancer, through research, education, advocacy, and service. The American Cancer Society publishes books on cancer that support patients, caregivers, and families dealing with a cancer diagnosis along with books on nutrition and healthy eating. Jeanne Besser is a former food columnist for the Atlanta Journal-Constitution and author of numerous cookbooks, including the American Cancer Society's The Great American Eat-Right Cookbook, What to Eat During Cancer Treatment, and The American Cancer Society New Healthy Eating Cookbook. Among her other cookbooks are The 5:30 Challenge: 5 Ingredients, 30 Minutes, Dinner on the Table; The First Book of Baking; and Working Mom's Fast & Easy Family Cookbook. She is coauthor of Tell Me the Truth, Doctor: Easy-to-Understand Answers to Your Most Confusing and Critical Health Questions. She lives in Princeton, New Jersey. Barbara L. Grant, MS, RDN, CSO, is the outpatient oncology dietitian nutritionist at the Saint Alphonsus Cancer Care Center in Boise, Idaho. At Saint Alphonsus, she provides individualized nutritional counseling and survivorship classes for people with cancer. Barbara has over 35 years of experience in cancer nutrition and is a Certified Specialist in Oncology Nutrition. Barbara has published and presented on a variety of diet, nutrition, and cancer topics. She has served on national boards, committees, and workgroups of the American Cancer Society, the National Cancer Institute, the American College of Surgeons' Commission on Cancer, and the Association of Community Cancer Centers.